• Hardware for AMPCO metal or laminate toilet partitions. Bottom door insert for metal partitions. For 1" thick round edge door. For unplated/unpainted finish, select part number C0140. For bright chrome finish, select part number 1005BC. Surface mounted diamond shape slide bolt latch with 2-3/4" between screws. 3" projection. 7/8" between screw centers. 2" projection. 2-1/8" diameter. 1-19/32" between screw centers. For AMPCO plastic laminate toilet partitions. For 7/8" thick square edge door. 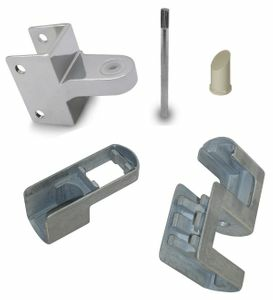 Top hinge pin for AMPCO plastic laminate toilet partitions. Knurled steel 7/32" diameter x 3-1/4" long. Bottom hinge pintle for AMPCO plastic laminate toilet partitions. 1/2" diameter. Bottom hinge nylon cam for AMPCO plastic laminate toilet partitions. Round for 1/2" pintle. 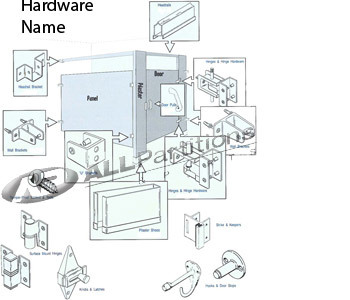 Top hinge for AMPCO plastic laminate toilet partitions. For 1-1/4" thick square edge pilaster. Bottom hinge for AMPCO plastic laminate toilet partitions. For 1-1/4" thick square edge pilaster.